D-I-Y-ers, this post is for you! This was such a fun and unique DIY project. And since I have a super awesome roommate who serves at an upscale restaurant, (shout out to Carlye!) we got all of our corks for free, making this project, in total, cost less than $15! 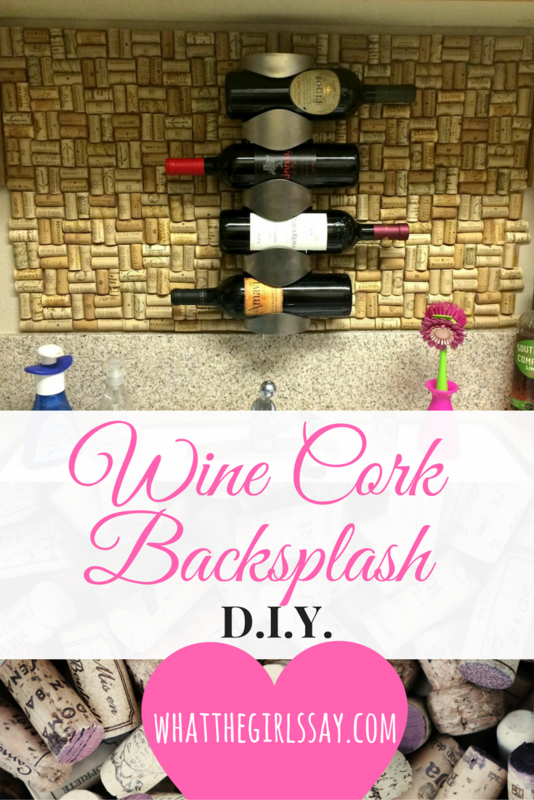 Grand Total for a brand new D.I.Y Wine Cork Backsplash?! Something to cut your corks...we used THIS. -or even ask the bar tender or server at restaurants you're at if they have any lying around in the back that they wouldn't mind grabbing for you. OR...If you would rather just buy corks, they are available online. A quick Amazon search and you can find deals like the one below. Check out Amazon's deals HERE! Whatever you do, start collecting your corks now! Amazon has this piece too... HERE! Cut your corks. We cut ours lengthwise, so we could see the brands on the cork, but you can cut it in half the other way to see the ends of the corks instead, if you prefer. Just be mindful, the ends can be different sizes due to swelling, if you are using used corks. Now this was the trickiest part for us...HOW to cut the corks. We tried scissors, steak knives, boxcutters (razors) and ended up using the sharp razors in the end. Like this one HERE . Another bonus of having a roommate who works in a restaurant, she brought home a cutting glove (like this one) to use so I wouldn't cut myself in the process. Saved my hand, I'm sure! So be EXTRA careful with this step. We got a cutting board and started slicing the corks in half. *Be super careful when cutting these. * It's a small space to be cutting, and they can slip out of your hands if you're not holding them tight As long as you are being careful and paying attention to what you are doing, you can do it with no problem. When you are finished cutting all your corks (or while you are still in the process and you're like me and want to do it as soon as possible), lay them out and start figuring out how you want it to look. After all your corks are cut, lay them out how you want them and glue them to your board. We used WOOD GLUE and I bought the one that was on sale...of course...remember, Savvy Saver over here! I couldn't wait for the glue to dry...which is why you see a blow dryer in the pictures above. I was just trying to help speed up the process. Can you blame a girl?! We also had an idea in mind that we wanted to add our own WINE HOLDER (we bought this one) in the center of our board, so we drew around that part and put the corks around it, leaving the center part open. *We did use screws to hang the wine holder....don't worry, we'll patch it when we move! We also had an idea in mind that we wanted to add our own wine holder in the center of our board, so we drew around that part and put the corks around it, leaving the center part open. *We did use screws to hang the wine holder....don't worry, we'll patch it when we move! Super easy, uniquely ours, wine-cork backsplash! let's get it done, hon!! Have you attempted a cork project? Or have been inspired to do so? Let us know in the comments below! Want to be updated when we post new awesome things like this?! Sign up for our newsletter here! We respect your privacy...and won't spam you!